The impact that Disney movies and their franchise has had on our culture is almost an epidemic of our times. There is no escaping the fact that since its inception, Disney continues to grow in popularity. As Halloween fast approaches, Dapper Day Outfits featuring new vintage Disney dresses are an excellent source of inspiration for creative party outfits. Here I have created some Disney inspired outfit ideas for adults. In the Vintage Inspired, Disney Looks collages, I have created styles for each movie that correspond with when the movies were actually made. These are easy Dapper Day outfits to wear again and again. Scroll to the end to shop Dapper Day dresses of your favorite characters. Most movies or television shows, even if they are set in a particular historical period, will display traces of the time in which they were made. For example, the movie ‘The Shocking Miss Pilgrim’ was set in the 1870s. However, as the movie was made in 1947, Betty Grable’s styling and costumes have a decidedly twentieth century inclination. In the past, costume design has been intricately linked and confined to the tastes and modes present at the time of inception. Although Disney movies are animated, they too, have not escaped this affectation. Although Disney had previously released animated shorts, Snow White and the Seven Dwarfs was the studio’s first full-length animated feature release. The movie was released in 1938, although work had began from as early as 1934. The aesthetics of the 1930s can be particularly evidenced in Snow White’s make-up and hair. The thin, curved eyebrows, rouged lips and waved hair all indicate an early 1930s style. Create a 1930s Snow White Disney inspired style with this look using red, white, yellow and blue clothing and accessories. To create a 1930s inspired Snow White outfit, opt for a color palette of yellow, white, blue and red. To keep the look true to character, wear a yellow toned skirt, with whites or blues for a blouse. S touch of red with a hat or hair accessory mimics her bow. Finish the look with dark red lips.is a replica from a 1935 shade, so you can be sure of an authentic style. A 1930s influence can be seen here in the make-up and hair styling of Snow White. Many of the costumes of Disney characters rely heavily upon colors. As with Snow White, the pairing of yellow, blue and red immediately recalls her character. Such is the power of Disney imagery. You shall be the belle of the ball in this 1950s Cinderella inspired outfit. Ballgown, jewelry, gloves, shoes and hair band. However, with Cinderella, immediately the glass slippers come to mind. To create a 1950s Cinderella style, choose a full-length gown of pale blue or shimmering grey. Ensure the waist is defined for a quintessential 1950s style, and the skirt is full and sweeping. Finish the look with long cream or white gloves, a black velvet necklace and drop earrings. Of course – the shoes are a key component in this style! This style from perfectly recreates the glass effect of the slippers, with their clear design. Many of the popular ball gown styles of the 1950s drew inspiration from the previous century. Thereby, allowing a 1950s Cinderella style to be achieved befittingly. Use bright, clashing colors to recreate the look of the Ugly Sisters. For the so-called ‘Ugly Sisters’ to enhance their position as the movies antagonists, clashing colors and textures may be employed to good effect. Here I have chosen styles that could be intermixed, reflecting their sister relationship. The petticoats are both available from House of Foxy. Add colorful shoes and gloves to match the dress. Full length or calf length 1950s style prom dresses may be worn to achieve a 1950s Disney inspired outfit. This dress by Hot Topic is a fabulous vintage inspired piece, with its 1950s silhouette. Plus sizes too. Look closely and you will see Disney princesses printed on the fabric! As much as I am sure many of us would love to dress up as a Disney princess, the villains of Disney can be equally as fun! For a 1960s Disney inspired outfit idea, I have chosen the formidable Cruella de Vil. One Hundred and One Dalmatians was the first Disney movie to be set in the actual time it was made. This allows Cruella’s costume to be a fair representation of late 1950s/early 1960s style. To create this look, choose a black structured pencil dress. Team with red and green accessories – I choose these red gloves from the House of Fraser as the faux fur trim was befitting. Stiletto pumps with their sharp angular lines and height reflect the pointed hostility of Cruella’s character. Of course, the outfit would not be complete without the addition of a faux fur coat! d Recreate Cruella’s style with these 1960s inspired pieces. Dress, coat, shoes, gloves, purse, jewelry and cigarette holder. Sadly, genuine fur was a popular clothing and accessory choice during the time One Hundred and One Dalmatians was made and set. However, in today’s times, there exists an abundance of faux fur materials to recreate the style without the cruelty. 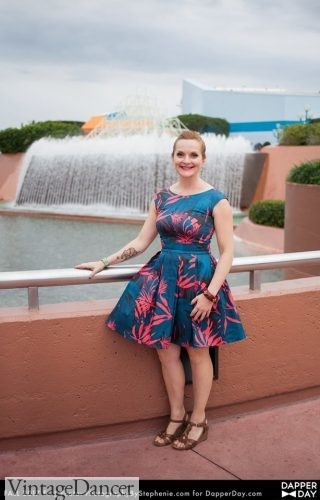 Another 50s-60s Dapper Day outfit is more subtle than a character outfit. My sister, Jenn, went as her favorite which has a fabulous vintage tiki theme. She found a tropical palm branch dress in the 60s style, paired it with vintage sandals and wore a tiki flower in her hair. It’s subtle but perfect for Dapper Day. How about one last character. From the movie UP. My husband and I love the love story between Carl and Ellie. We wanted to dress up as them for Halloween but not in their childhood clothes. Instead, we opted for a brief scene in the 1940s when Carl and Ellie were working in a Zoo as a zookeeper and balloon cartman. I wore a safari tan shirt and shorts with rubber rain boots, pith helmet and scarf. Oscar wore a white dress shirt, armband, striped tie, suspenders, blue pants and glasses. Our baby helped us by being the parrot. Carl and Ellie and Parrot from UP – Our Outfits. Ready for Halloween or Dapper Day. To add a hint of Disney style to a vintage inspired outfit, bothand currently carry Disney inspired collections. Whilst some of the pieces fall into the costume category, other styles utilize a vintage inspired silhouette to display Disney prints and fabrics. Disney inspired clothing is not just for special occasions or Halloween. Of course, it can be just for Halloween; due to the great selection of Disney costumes available. But through the use of colors, prints and styling, a Disney inspired look can easily be achieved through daily wear, to suit a vintage inspired wardrobe.